In this piece I explore the question of what remains when people are gone. I am looking at what physically survives the passing of time and the passing of people. We are left with a space they once inhabited. An article of clothing. A favorite possession. We can hold onto souvenirs, relics or heirlooms in an attempt to maintain a physical connection to the past, an event, or a person. Photography theorist Roland Barthe writes in Camera Lucida about the relationship between the clear symbolic meaning of a photograph, which he calls the studium and the thing in the photo that pierces the viewer, which he calls the punctum. The punctum is a detail that has nothing to do with the meaning of a photo that attracts a viewer to the photo. It can be very peculiar and highly individual. Although I did not create Heirlooms with this in mind, the work can be seen as an illustration of this concept. 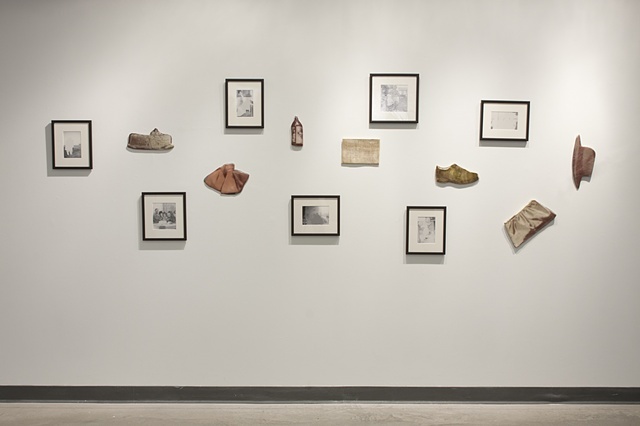 The photographic components acting as the studium, the ceramic objects highlighting the punctum. Barthe also writes about photographs ability to assert, She was there. They demonstrate what was and provide evidence of what has ceased to be. Portraits and snapshots of people, rather than making reality constant, remind viewers of the constant change we experience. Thus, Barthes writes about the recurrent feeling of loss he experiences whenever he looks at a picture of his deceased mother. Heirlooms presents this perspective as well. The part of the photographs we most want to see, the people, we cannot.